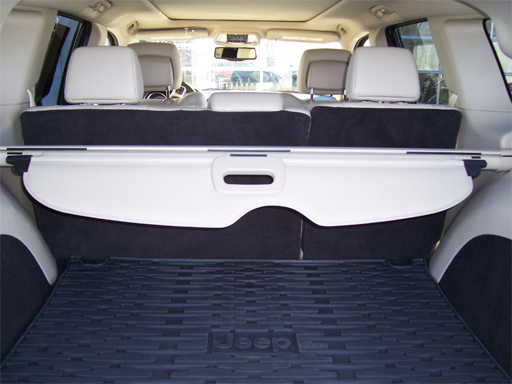 If you're driving with valuable luggage or documents in the back of your Jeep Grand Cherokee, and you want to protect that cargo and keep it secure, the Cargo Area Security Cover available at JustforJeeps.com will keep what's important to you safe from theft by keeping it out of sight from would-be-thieves. Keep the contents hidden from view and also safe from the sun with a special UV blocker. When you don't need to use the cover, it retracts out of the way. Get the cover in colors that match the interior of your 2011-2019 WK2 Grand Cherokee. Available in colors that match vehicle's interior. Same as factory. Please select correct color above. Apparently some WK2's don't come with the cover......Regardless, this product, OEM or not (I don't know) is perfect. Worth the price and your consideration. Pros1) Matches interior color. 2) Perfect fit. 3) Superb customer service 4) Easy to order. Good fit in the jeep. Lacks a backup cover between the rear seats and the cover frame. ConsNeeds a back extension to cover exposed area. This is a genuine Mopar part. Fit and finish are perfect. Much better than the cheaper knock offs available on eBay and Amazon. My order was processed and shipped the same day, with receipt two days later, shipped by FedEx ground. Arrived in perfect condition. I'll order from them again for any of the Jeep parts I need. This cover is a perfect color match for the interior of the GC as well as a good fit..
My 2018 Grand Cherokee didn't come with a security cover like my 2002 did and my wife and I really missed it. This security cover is more heavy duty than the one on our 2002 and that was factory issued. You won't be disappointed with your purchase. ConsNone. If you want quality you have to pay for it. When I bought my jeep, It did not come with this so I purchased it through just for jeeps because I had a sub installed and i wanted to protect and hide my sub so no one would be tempted to break a window and steal it. With this pulled all the way out there is no way to see what is in my back. Ordered in afternoon, received next day. Great match of interior color. ProsGreat customer support. Product damaged in shipping and replacement sent immediately. excellent price for the cargo cover, fast shipping and came as advertised. Great place to buy accessories for your jeep. When you buy an after-market product, you never really know what you are going to get. The cargo cover is the perfect cover, fits like a glove, and you could never tell that it is not original to the car. Love it! Great item and fast shipping. ProsFits perfectly. Exactly as described. OEM. Fit perfect in my 2017 Jeep. Looks great and covers everything in the storage area. Price was right, quality piece! Good quality product, pricey for a glorified window shade. 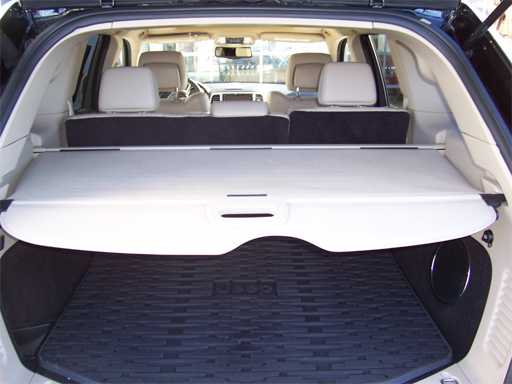 The cargo area security cover is an OEM quality item. We had a previous Grand Cherokee that included a security cover which we found very useful. Our new GC did not include the cover. Perfect fit looks great! Exactly as I imagined it would be, looks very sleek and organized now! Keeps all my things securly hidden and looking good doing it! ProsLook and fits permit easy to install took just 30 seconds! I received the ordered part in a couple of days. Very fast shipping. It fits great and JustForJeeps saved me quite a bit of money. Fast shipping, packaged securely, perfect fit. Shipped within a few hours of purchase and on my porch within 24 hours, very pleased since I live on the far East end of Long Island. Brand new OEM product, perfect fit on my 2012 G.C. altitude. I received this cargo cover the day after I ordered it. It's just what I wanted. Fits perfectly in my 2013 Grand Cherokee. I would highly recommend this item. It has proven quite valuable to be able to hide what is stored in the truck. The only negative is that the rear row of seats must me fully reclined in order to ensure there is not a gap between the seats and cargo area security cover.